Support members of our parish who wished to go on missions- long term and short term. Our parish also set up a line item in our parish annual budget for missions. It wasn’t very large but it was very helpful. Very quickly we started inviting long term missionaries to our parish to make presentations. We would often have them give the sermon on Sunday and then pass a tray to collect money for the mission. Sometimes, we would sponsor an evening with the missionary and invite the parish to come and hear what they are doing. Again, we would collect money for their mission. We sent several of our parishioners on short term OCMC teams (3-4 weeks) to Alaska, Kenya, Tanzania, Albania, Brazil, and Romania. In each case, we helped the individual raise the needed funds. We even sent one long term missionary to the Philippines and Hong Kong. We participate in the OCMC SAMP program- Support a Mission Priest. Our community supports one priest and individuals in our parish support others. At any one time we will have 10-20 AGAPE canisters out in local businesses. The money collected from these canisters funds medicines and staff at Orthodox hospitals and clinics worldwide. Then one year, we invited Fr. Luke Veronis to give a Lenten Retreat at our parish on a Saturday during Great Lent. Fr. Veronis had been a long term missionary in Kenya and in Albania. His father, Fr. Alexander Veronis was the first chairman of the OCMC. Fr. Luke told us he was going to make three separate presentations: international, national and local missions. His first presentation was international missions, and he discussed the wonderful work the OCMC was doing in sending missionaries to far away sites like Kenya, Tanzania, Uganda, Albania, Romania, etc. His next presentation was on national missions. His last presentation of the day was local missions. He started out by reading the last words of Jesus before he ascended into Heaven: Acts 1:8: “You shall be my witnesses in Jerusalem, Judea, and Samaria and to the end of the earth”. He then turned to me and asked “John, where is your Jerusalem?” Fr. Luke caught me by surprise. I really did not know what he was after. He asked me again. “John, where is your Jerusalem?” I still did not get it. Finally, he asked me, “John, in what city is your church located?” I knew that answer, “Falls Church, Virginia.” “That is your Jerusalem” he said. “OK now, where is your Judea”. Now I got it! “Virginia”, I said. “Right!” Thank heavens he didn’t ask me where is my Samaria. Fr. Luke went on to explain that we too often think of missions as something foreign and exotic- travels to Africa, Asia, etc. Mission work, as Christ made clear, begins in your own town and your own state. Fr. Luke went on to describe how we can witness in our own town and state. Find out where there is great need and be there. This led to a very productive discussion and opened our hearts and our eyes. After the retreat, I decided to find out if there were homeless shelters near our church. I was told by longtime members of our church that there were not homeless shelters in our Fairfax County- which was at the time the wealthiest county in America. So I googled it and found ten homeless shelters in Fairfax County, one about one mile from St. Katherine. No one in our parish knew about the shelter. A five minute drive and I was at the shelter and saw firsthand what our county was doing to help the homeless. But what made a bigger impression on me was that I saw a list of Catholic and Protestant Churches that would go there regularly to serve food and help in any way. There was even one synagogue on the list and a Mosque! No Orthodox church however had ever gone there. After a brief discussion, it was agreed that St. Katherine would be coming once a month to serve dinner. We now go twice a month and serve food to the homeless. We were told they were in desperate need of clothing for the homeless. We now collect clothes and toiletries all year long and by rotation, a different family takes the clothes to the shelter every week. During the winter months when the shelter does not have enough room for everyone who would like to stay, they give the homeless a hot meal and have to send them out to community shelters which can only offer them a bed for the night. But for those, they are given a Hygiene and Survival Kit that includes a woolen cap, socks, gloves, hand warmers, tooth paste and brush, shaving cream and razor and shampoo. Our St. Katherine parish has agreed to fund these kits. All our church organizations donate one or more of the items, and our Sunday School Children put the kits together after our Christmas Pageant. This year we delivered over three hundred kits. Soon an amazing development occurred. As we began local outreach, other Orthodox churches in the greater DC area soon asked if they could join our mission committee. Our committee now consists of three OCA churches, two Antiochian churches and one other Greek Orthodox Church. We decided to rename our committee the DC Metropolitan Orthodox Mission and Outreach Committee. Monumental Missions Walk fund-raising event in Washington, DC. We continue to do local outreach. 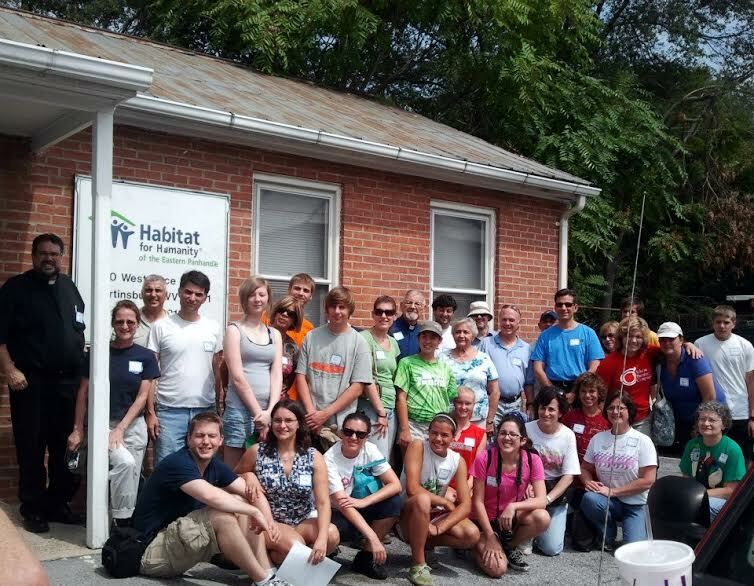 We have sent two teams to Habitat for Humanity building programs. We have worked with FOCUS North America to distribute shoes to homeless children in the DC metropolitan area. We have sponsored several Red Cross Blood Drives. Even as our local outreach has broadened and developed, we have also expanded our overseas missions. We have sent a long term missionary to Tanzania. One of our parishioners just returned from a short term team to Kenya. We have helped sponsor an Antiochian Orthodox college student for a short term team to Alaska. What we have also witnessed is that several other Orthodox parishes that have joined our group are now doing their own local outreach and going to their local homeless shelters, to their hospices, etc. We thank the Lord that we have found our Jerusalem. Where is your Jerusalem?? Where is your Jerusalem? Are you or your parish engaged in any outreach programs to the community there? Any ideas for developing others? Where is your Judea? Dr. Demakis’ article demonstrates the greater effectiveness that can be achieved when people or parishes work together. Is that a possibility in the greater area where you live? Dr. Demakis suggests working together to support Orthodox agencies such as International Orthodox Christian Charities (IOCC) and/or the Fellowship of Orthodox Christians United to Serve - North America (FOCUS NA). Where is your Samaria? Is it some nearby area or group of people in need of help that you do not feel comfortable approaching? What are the reasons? Might they be overcome? And to the Ends of the Earth. In what ways can you work with Orthodox agencies such as IOCC and OCMC to promote worldwide missions and outreach? Dr. John Demakis is a retired cardiologist and a member of the St. Katherine Greek Orthodox Church of Falls Church, Virginia. He chairs the DC Metropolitan Orthodox Mission and Outreach Committee. He is also the chairman of the Health Care Committee for the Orthodox Christian Mission Center (OCMC) and is a founding member of the Orthodox Christian Association of Medicine, Psychology and Religion (OCAMPR). John is married to his wife Katherine for 48 years and they have three children and six grandchildren.